Adverse drug reactions continue to pose a major impediment to drug development, and the clinical management of marketed products. These are typically divided into acute, dose dependent reactions (Type A), and reactions that may occur in only a small percentage of patients, where the frequency of occurrence in the population is not dependent on dose (Type B), although more complex classifications have also been proposed, (Park et al, 2000). According to a recent PhRMA review, the most frequently encountered toxicities in pre clinical drug development are hepatotoxicity and dermal reactions (Olson et al. 2000). Hepatotoxicity may take many forms (Ward and Daly 2001), so implying drug metabolism generally would be presumptive, but as the major organ responsible for the metabolism of drugs it seems clear that metabolism is important in many cases. Type A reactions generally may be mediated through parent compound or metabolites, and the role of chemically reactive metabolites has been well recognized (Hinson et al. 1994). Type B reactions, also referred to as idiosyncratic or hypersensitivity reactions, have been the subject of extensive reviews in recent years (Uetrecht 2000, Ju and Uetrecht, 2002). These are generally believed to be immune mediated, and are not predictable from pre clinical animal studies, thus they may not be identified until late clinical stages, or post marketing. Type B reactions have been reported to constitute 25% of all clinical adverse events ( Lazarou et al, 1998). While direct T cell stimulation has been proposed as a possible mechanism (Zanni et al. 1998), bioactivation to reactive metabolites that covalently bind to proteins is still believed to be a key event in the origin of most Type B reactions, and is the basis of the Hapten hypothesis (Uetrecht 2003). Much has been written on the role of covalent binding for both type A and Type B reactions (Knowles et al. 2003), and clearly protein binding can be dissociated from toxicity ( Goldlin and Boelsterli 1994). The dilemma of the significance of protein binding in type B reactions can be addressed in part by the Danger Hypothesis, where by the immune system requires a second signal to trigger a response (Matzinger, 1994). This may be cellular damage or an infection (Pirmohamed et al. 2002). Thus in general covalent protein binding is still considered a key factor in most Type B reactions. Drug metabolism therefore, is implicated in the most problematical toxicities in drug development and clinical practice. This raises the question whether such properties can be rationally designed out at an early stage of development, based on knowledge of metabolic pathways or simply structure, and such consideration have been widely discussed (Uetrecht 2000). The ability to do this effectively remains elusive, but it seems clear that an understanding of how functional groups can be metabolized to reactive metabolites is likely to reduce the prevalence of both type A and B reactions. This review will survey the more extensively studied reactive metabolites which have been encountered in drug molecules. Up to 30 different types of functional groups have been shown or implicated to undergo some type of metabolic activation, (personal observation). However, those most frequently encountered in drug development may be only about one third of this. Reactive metabolites can be broadly grouped into either electrophiles or radicals. Carbenes would not fall into either group, and while well recognized as a species involved in CYP (Cytochrome P450) inactivation (Murray et al. 1985) they have not been significantly implicated in toxicities. To some degree, the different biological effects of electrophiles and radicals can be rationalized based on their chemistry. Thus the closed shell electrophiles will react readily with biological nucleophiles, such as proteins to give covalent adducts, where as radicals are more likely to abstract a hydrogen radical from the protein (Sorani et al. 1994). However, oxygen existing in the triplet state, is ideally set up to react with unpaired electron species, and so this tends to be the more prevalent reaction course for many radicals. Consequently, free radical formation is more frequently associated with oxidative stress, and electrophiles with covalent binding. While radicals may be implicated in some idiosyncratic reactions, for most drugs showing this form of toxicity where a bioactivation mechanism has been proposed, most appear to involve electrophiles (Li 2002). This statement is something of a generalization however, and as more work is done specifically looking for radical formation more examples may be found. Reactive metabolites may be derived from a wide range of metabolic reactions including oxidation (CYP, peroxidases, MAO (Monoamine oxidase)), reduction (CYP, CYP reductase), and conjugation (glucuronyl transferases, sulfotransferases, glutathione transferase, Acyl Co-A synthase). While oxidative CYP mediated reactions predominate, peroxidases present in blood cells may play a major role in agranulocytosis and other blood toxicities. There are a number of recent reviews of metabolic activation covering the ranges of structures which have been shown to have bioactivation potential (Uetrecht, 2003 Nelson, 2001). This review will focus more on the commonality of reactivity patterns for reactive metabolites derived from these widely different structural features. This may help to simplify the mechanistic aspects of this undesirable drug development property. Regardless of the structure from which they are metabolically derived, electrophiles may be grouped as either: 1. Acylators, 2. Activated double bonds, 3. Other electrophilc carbon centers, or 4. Electrophiles based on nitrogen or sulfur, or derived from sulfur oxidation. An important and quite common observation is that metabolism of a particular functional group may give rise to more than one type of electrophile, as shown in some of the examples below. These may be defined as electrophiles which result in the biological nucleophile being bonded to an sp2 hybridized carbon, usually double bonded to oxygen. Examples of functional groups which may produce acylating electrophiles are: carboxylic acids, acetylenes, formamides, halogenated hydrocarbons, and thiazolidinediones. Carboxylic acids may act as acylators either via glucuronidation or acyl CoA ester formation (Figure 1). Figure 1. 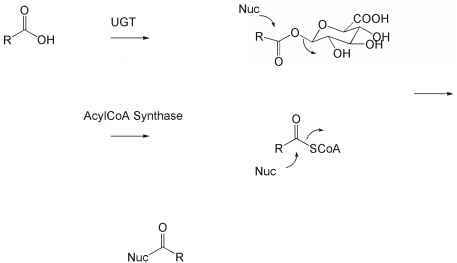 Acylating metabolites derived from conjugation of carboxylic acids : acylglu-curonide and acyl CoA esters. Acyl glucuronides are perhaps the most widely studied of reactive metabolites, and there are many good reviews on this subject (Spahn-Langguth and Benet 1992, Sallustio et al. 2000). A large number of carboxylic acid containing drugs known to be metabolized by acyl glucuronidation, have been marketed. This level of clinical experience makes this functionality some what unique as regards the potential for an empirical risk assessment. Of note are the number of drugs metabolized via acyl glucuronidation which have been withdrawn from the market for safety reasons, (Table 1). Between 1974-1993, there were a total of 29 drug withdrawals for safety reasons from the U.S., U.K and Spanish markets (Bakke 1995), and seven of these are reported to be metabolized by acyl glucuronidation. While no causative link has been found between acyl glucuronidation and the limiting toxicities for these compounds, it is a pathway of metabolism observed in a significant percentage of compounds which have been withdrawn from the market due to safety factors. In addition to acting as acylating agents, acyl glucuronides can undergo an intramolecular rearrangement to generate an aldehyde which can bind to proteins, (Figure 2). This mechanism is distinct from the acylating mechanism, thus the acyl glucuronidation pathway can give rise to two distinct types of reactive species. Figure 2. 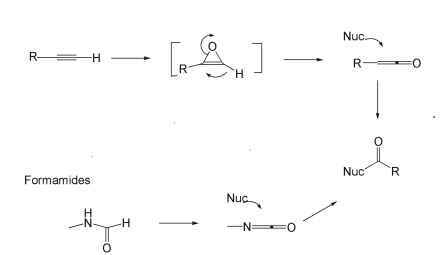 Migration of acylglucuronides to generate an electrophilic carbon center (aldehyde), reaction with nitrogen nucleophile of proteins, and rearrangement to a stable product. Carboxylic acids may also be metabolized to acylating agents via formation of acyl CoA esters, which can lead to covalent binding, and this constitutes an alternative bioactivation pathway which has been proposed to lead to toxicity, (Li et al. 2003a, Li et al. 2003b). Figure 3. Oxidation of acetylenes and formamides to give acylating metabolites. Similarly, formamides on oxidation have been proposed to form isocyanates which may act as acylators, (Borel and Abbott 1995, Kennedy 2001) but examples of drugs containing acetylene or formamide functions are less common. Halogenated hydrocarbons (in contrast to halogenated aromatics) are a structural feature not widely encountered in drugs, but certain anesthetics agents in this class of compounds are among the most mechanistically well studied in regard to metabolic activation and idiosyncratic reactions. The best example is halothane (Figure 4) which undergoes oxidation to generate an acyl halide, a very effective acylating agent, (White and Matteis 2001). The protein targets for the acyl halides, and their implication in the immune response have also been studied (Pumford et. al. 1993, Martin et al. 1993). Halogenated hydrocarbons can also be bioactivated by glutathione conjugation, followed by a series of steps to generate thioacyl halides (Figure 5). Nephrotoxicity has been a common observation for compounds showing this pathway, but impairment of mitochondrial function and other toxicities have also been noted (Cooper et al. 2002). Figure 4. Oxidation of halothane to an acyl chloride. Figure 5. Generation of an acylating thioacyl metabolite via conjugation with glutathione. Figure 6. Oxidation of the thiazolidinedione ring system to give a thiocyanate which may act as an acylator, and a sulfenic acid (electrophilic sulfur center). 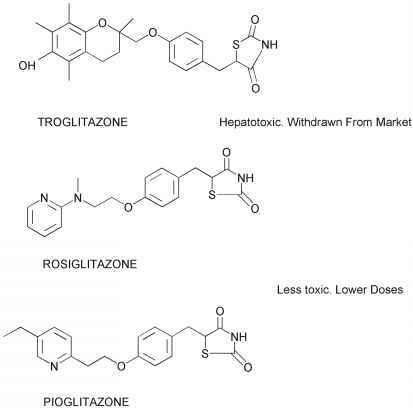 containing drugs such as pioglitazone and rosiglitazone, are also likely to have this oxidative pathway, however these drugs are considered to be essentially non hepatotoxic, (Figure 7). This is most likely due to the much lower doses at which these drugs are used (Cox et al. 2000, Gillies and Dunn 2000 ). PIOGLITAZONE Figure 7. Examples of thiazolidindione containing drugs. Figure 8. Quinone type structures which may be formed metabolically, which may act as Michael type acceptors. Figure 9. Examples of drugs metabolized to quinone type activated double bond electrophiles. Table 2. 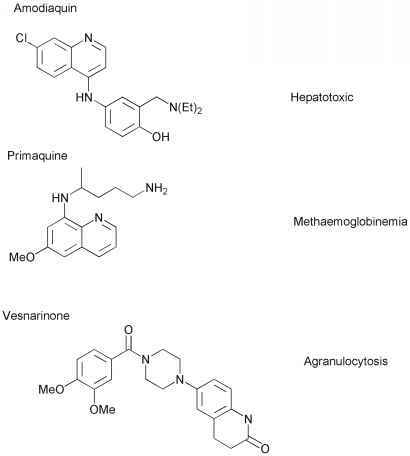 Examples of drugs which may form quinone like metabolites. 1. Redox cycling has also been implicated. 2. Other reactive metabolites such as an epoxide are also formed. 3. A quinone imine metabolite has not been officially proposed, but is likely candidate for the reactive metabolite based on reported metabolic information. three of these drugs are shown in Figure 9, where by the structural features that lead to these types of reactive metabolites are apparent. 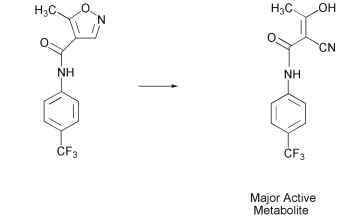 Of novel interest is p-trifluoromethylphenol, which can form a quinone methide non enzymatically with loss of HF (Figure 10). This ultimately leads to formation of a carboxylic acid group, but the intermediate quinone methide has been trapped with glutathione, and p-trifluoromethylphenol is hepatotoxic in vitro (Thompson et al. 2000). Aryl trifluoromethyl groups are not normally considered to have metabolic risk, but where relevant structural features exist, this may not always be the case. Figure 10. Hydrolysis of p-trifluoromethylphenol to from an electrophilic quinone methide. Leflunomide (Figure 11) shows a high enough incidence of hepatotoxicity that public interest groups have lobbied for it's withdrawal. The FDA has subsequently ruled in it's favor, and more recent studies suggest that the hepatotoxicity is manageable (Van Roon et al. 2004) . Imino methide formation would seem to be feasible here, either directly or after amide hydrolysis. However, no such mechanism has yet been demonstrated. The major metabolite observed is the ring opened structure shown which is a malononitrile, isomeric with the isooxazole ring, (Kalgutkar et al. 2003). Leflunamide Figure 11. The Metabolism of Leflunomide. Mechanistically distinct from the above aromatic systems is the case of the antiepileptic agent felbamate, which also produces a metabolite with an activated double bond. While not toxic in rats, Felbamate showed idiosyncratic toxicities in humans, chiefly hepatotoxicity and aplastic anemia which resulted in a Black Box warning for the drug. This may be rationalized based on differences in metabolism (Dieckhaus et al. 2000). Felbamate is a bis-carbamate of a propane 1,3 diol (Figure 12), and following hydrolysis and oxidation, carbamic acid can be eliminated to give an unsaturated aldehyde (designated as ATPAL by the authors). 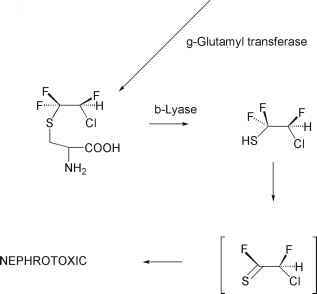 This will form glutathione conjugates in vivo confirming it's electrophilicity, and this pathway appears to be more prominent in human. Rats metabolize the drug predominantly by direct oxidation of parent. The reverse transcriptase inhibitor Abacavir marketed for the treatment of HIV infection shows hypersensitivity reactions in a small percentage of patients. The drug is metabolized by alcohol dehydrogenase isozymes to produce an aldehyde intermediate that binds to proteins and this is likely to involve a 1,4 addition mechanism, (Walsh et al. 2002). Drugs may also indirectly produce activated double bond electrophiles from endogenous compounds via lipid peroxidation. This is associated primarily with drugs that form free radicals (see below). For example, 4-hydroxynonenal, a known product derived from radical mediated lipid oxidation, is believed to be toxic due to its inherent electrophilicity and protein binding potential (Laurent et al. 2000). 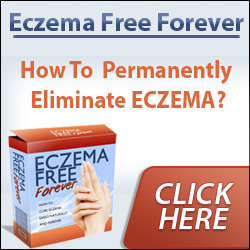 Thus for idiosyncratic immune based reactions, this provides an alternative mechanism by which haptenized proteins may be generated, involving an electrophilic process but, initiated by free radicals. This mechanism however, remains hypothetical. Figure 12. The metabolism of Felbamate to a reactive metabolite containing an activated double bond. The k excessive heterocycles furan and thiophene are present in a wide array of drugs and their electron rich state makes them prime sites for oxidative metabolism. In both cases, oxidation leads to structures whose chemical reactivity is basically that of activated double bonds. Menthofuran is a hepatotoxic terpenoid present in mint plants, which contains a furan that is bioactivated via oxidation to a ring opened 7 ketoenal, (Figure 13) a reactive Michael type acceptor (Thomasson et al. 1991). Thiophene can be oxidized to S-oxides which have activated double bond character (Figure 14), but in this case the ring system stays intact (Dansette et al. 1992). Tienilic acid, a thiophene containing diuretic, was withdrawn from the US market in 1980 due to immunoallergic hepatitis. 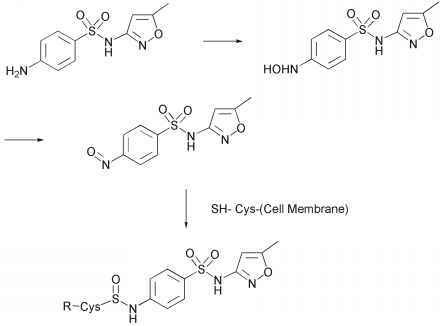 The metabolism of this drug has been extensively studied, and toxicity is believed to be due to this type of S-oxidation pathway (although an arene oxide type mechanism has also been proposed). Mechanistic aspects leading to the immune mediated hepatitis, have been reported (Bonierbale et al. 1999). Figure 13. The oxidation of furan to an activated double bond type metabolite. Figure 14. The oxidation of thiophene to a thiophene -S- oxide, reactive by virtue of an activated double bond character. Another heterocyclic ring system capable of bioactivation is the indole ring which has appropriate 3-substitution. 3-Methyl indole is a pulmonary toxin that undergoes dehydrogenation of the methyl group by CYP2F1 to produce a methylene imine (Figure 15) which can covalently bind to proteins (Lanza et al. 1999). Figure 15. Activated double bond metabolite derived from oxidation of 3-methylindole. 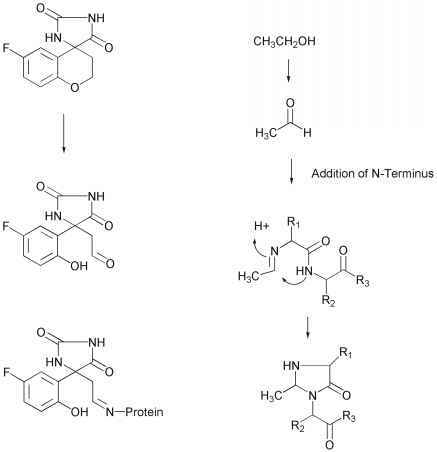 The above indicated reactions for these five membered heterocycles constitute only a portion of the types of transformations possible for these structures, yet represent the most probable bioactivation pathways. The metabolism of five membered heterocycles has been recently reviewed, (Dalvie et al. 2002). There are a number of other carbon centered electrophiles that can be distinguished from acylators or activated double bonds. These include epoxides, arene oxides, imines and some carbonyl compounds. 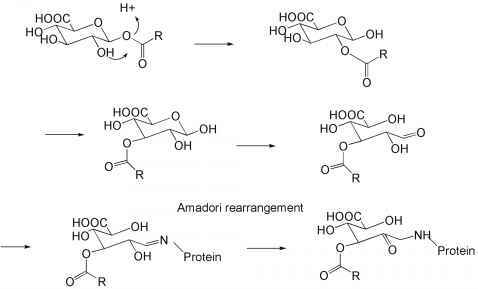 The most important example of the latter is the aldehyde /Amadori mechanism for covalent binding of acyl glucuronides to proteins mentioned above (Figure 2). It is important to note that a large number enzymes have evolved specifically for the metabolism of the carbonyl group (Rosemond and Walsh 2004). This is likely due to two reasons: 1. The low reactivity towards one electron oxidative or reductive processes, making them poor substrates for CYP mediated transformations, and 2. Their inherent electrophilicity. Thus the diversity of enzyme systems and isozymes that have evolved to process aldehydes and ketones speaks to their biological significance. Aldehydes are initial products of O-and N-dealkylation reactions, although these are not frequently associated with adverse events. The aldose reductase inhibitor, Sorbinil, shows hypersensitivity reactions manifested by rash and fever, and in rare cases more severe dermal reactions. 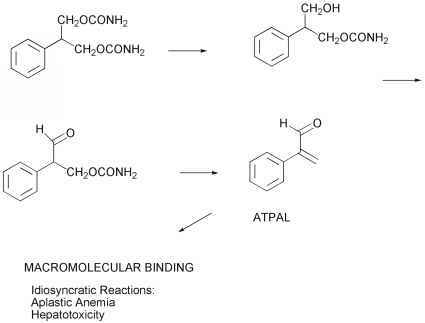 Bioactivation has been proposed to be due to an O-dealkylation process with subsequent covalent binding of the aldehyde to form a Schiff base (Maggs and Park 1988). One mechanism for ethanol induced hepatitis has been proposed to involve oxidation to acetaldehyde and Schiff base formation with N-terminal amino groups on proteins. These can be subsequently stabilized by a cyclization process to form imidazolidindiones. (Sillanaukee et al. 1996). These mechanisms are outlined in Figure 16. Figure 16. Sorbinil and Ethanol : Examples of compounds where toxicity has been proposed derive from aldehyde formation, showing their proposed reaction with nitrogen protein nucleophiles. Aliphatic epoxides (as distinct from arene oxides), are probably of more toxicological importance for industrial chemicals than for drugs (Melnick 2002). The toxicity of mycotoxins, such as aflatoxin is believed to be mediated through epoxide formation (Galtier 1999, Guengerich and Johnson 1999). Arene oxides are more widely implicated in drug toxicities, even though much earlier work on these electrophiles was done to elucidate the mechanism of carcinogenicity for poly cyclic aromatic hydrocarbons (Jerina, 2000). Cabamazepine is an anticonvulsant associated with various hypersensitivity reactions. Metabolism is complex, and an arene oxide has been suggested as a metabolite that might be associated with the idiosyncratic reaction, but an epoxide, and quinone imines have also been proposed (Figure 17) (Madden et al. 1996). Lamotrigine (Figure 18) is used as adjunct therapy in epilepsy, but shows a rare incidence of a severe dermal reaction, (Stevens Johnson Syndrome). Presumed to be immunologically based, bioacti-vation pathways have been investigated, and evidence for arene oxide formation in rats has been demonstrated (Maggs et al. 2000). While this pathway has not yet been demonstrated in humans, it does constitute the most likely metabolic activation pathway associated with the idiosyncratic reaction. Imines form another class of electrophiles in this group, and are formed from oxidation of alicyclic amines. These functionalities are very common in drugs, but to date there appear to be few cases where their formation has been associated with toxicity, (Gorrod and Aislaitner 1994). Figure 17. 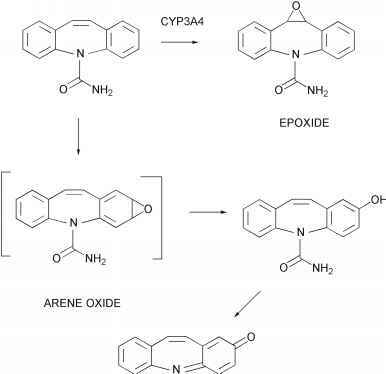 The metabolism of Carbamazepine to reactive carbon centered electrophiles : epoxide and arene oxide. A quinone imine (activated double bond) has also been proposed. Figure 18. The metabolism of Lamotrigine to a glutathione adduct, consistent with an arene oxide intermediate. Electrophiles Localized on Nitrogen or Sulfur, or Derived from Oxidation of Sulfur. Functional groups that are capable of generating this type of electrophile include : nitroaromatics, aromatic amines and hydroxylamines, thioureas, and thiazolidinediones. Nitoaromatics may undergo reduction usually mediated by CYP or CYP reductase. The initial one electron reduced product is the nitro radical anion, which may undergo redox cycling generating active oxygen species (see below). Further reduction generates nitroso and hydroxylamine species, both of which posses electrophilic nitrogen centers. While nitro aromatic groups are generally avoided in drug development for this reason, this metabolic pathway may be encountered inadvertently in natural products. 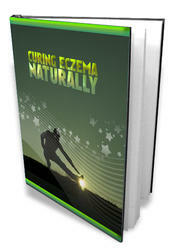 An example is the procar-cinogen aristolochic acid, a component of certain Chinese herbs. The herbal product had been taken as a dietary supplement and weight loss agent in some European countries, and has been associated with carcinogenicity and renal nephropathy. 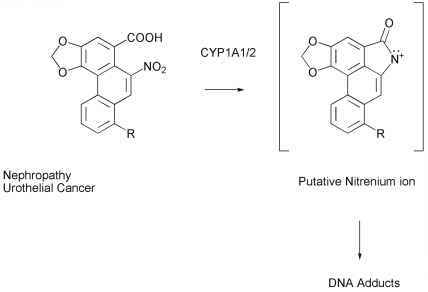 Aristolochic acid is an aromatic nitro derivative, and has been shown to undergo CYP mediated reduction to an electrophilic nitroso derivative which subsequently forms DNA adducts, the presumed mechanism for the observed toxicity (Stiborova et al. 2001), (Figure 19). Figure 19. The reduction of the nitro group of Aristolochic acid to generate an electrophilic nitrogen center, and its reaction with nucleosides. Aromatic amines may be oxidized to these same intermediates, and Sulphamethoxazole is probably one of the most studied compounds in this respect. This aromatic amine containing sulphonamide is associated with a range of idiosyncratic reactions (e.g. fever and rash) in 2-3% of the population. Metabolism is known to involve oxidation of the aromatic amine function to hydroxylamine and nitroso derivatives. These have been shown to react with biological nucleophiles (Naisbitt et al. 1996), and haptenize lymphocytes and neutrophils (Naisbitt et al. 1999), (Figure 20). Other aromatic amines such as acetylaminofluorene and 4-dimethylaminobenzene, have well recognized carcinogenic properties. This appears to derive from the formation of hydroxy-lamines which subsequently undergo sulfation followed by nitrogen/oxygen bond cleavage to form electrophilic nitrogen species, most likely nitrenes (Chou et al. 1995, Glatt 2000). Figure 20. The oxidation of sulfamethoxazole to an electrophilic nitroso metabolite and its reaction with cell surface thiols. Simple thiourea containing compounds may show hepatic or pulmonary toxicities believed to be associated with bioactivation, and covalent binding of sulfur (Hanzlik et al. 1978, Scott et al. 1990), although the mechanism has not been clearly defined. Both CYP and FMO mediated metabolism has been implicated. Thioamides will also inhibit thyroid functions, and have been used in the treatment of hyperthyroidism. The major adverse reactions for these drugs are hematological dysfunctions and immunosuppression (Bandyopadhyay et al. 2002). The thyrostatic agent propyl thiouracil is associated with idiosyncratic agranulo-cytosis, and metabolism has been shown to involve oxidation of sulfur to a sulfonate derivative (Waldhauser and Uetrecht 1991). This is likely to involve the formation of the intermediate oxidation states corresponding to sulfenates and sulfinates. Sulfenyl chloride formation via myeloperoxidases and hypochlorite was also proposed, and both this, and the sulfenate possess electrophilic sulfur centers, (Figure 21). However, the sulfonate metabolite of propylthiouracil itself also appears to be chemically reactive, and has been shown to cause T-cell sensitization, (Von Schmiederberg et al. 1996). Sulfonates are not usually considered good leaving groups, but in the case of those derived from thioamides their displacement by nucleophiles is precedented, (Bartke and Pfleiderer 1989). Therefore, reaction of propylthiouracil sulfonate with sulfhydryl groups of proteins, is likely to be the means by which this drug covalently binds to proteins. Figure 21. The sulfur oxidation of propylthiouracil to generate electrophilic metabolites. Thiazolidinediones as discussed above, may undergo oxidative ring opening to form sulfenic acid derivatives (Figure 6), and a glutathione adduct, consistent with the formation of such a metabolite, has been isolated (Kassahun et al. 2001). More recently a different glutathione adduct of troglitazone has been identified, which has also been proposed to derive from sulfur oxidation, but via sulfonium ion formation, (He et al. 2004).